What would we do without tools? Handheld and big machinery devices help us create buildings, artwork, crafts, and furniture; cook delectable meals; tend the garden; and keep our vehicles and homes in tip-top shape. Even animals use sticks, rocks, and their own paws as tools to get food and build homes. To celebrate today’s holiday make sure your tools are all in order and working, or if you’ve had your eye on a new tool, treat yourself! There’s a lot of building going on! Where to start? Well, that depends…. “To build a house, start down low” and use these tools: the chalk line, the chisel, the jointer, and the float. “Whose tools are those? The mason’s!” What does he use them for? He’ll tell you himself: “I smooth the cement until it’s flat.” Where do windows go? Way up high! Here are the hammer, the level, the square, and the saw. Can you guess who uses those tools? They belong to the carpenter! He’s cutting the frame where the windows will go. Image copyright Jim Datz, 2015, text copyright Toni Buzzeo, 2015. Courtesy of Harry N. Abrams Books for Young Readers. Children are naturally curious about the tools, utensils, and machinery they see adults using. Toni Buzzeo’s delightful board book introduction to twenty-four tools for the youngest readers will capture their interest and imagination with fun prompts and a house-construction project in process. Buzzeo’s enthusiastic language and guess-who format invites multiple readings during which little ones are sure to memorize the names of all the tools and recognize them in the “real world” when they see them. Through Jim Datz’s cheery illustrations, kids watch as a cozy house comes together from foundation to finished as they learn the shape of each tool and see some being used. Questions are introduced on the left-hand page while the particular tools, drawn with sweet, smiling faces, are named on the right. This page opens to a double spread in which both men and women workers are busily and happily plying their trade. The final image will bring a giggle from kids as they discover that the house being built is actually a house of blocks being carefully constructed by a little girl and boy. Whose Tools? would make a welcome baby gift and a fun addition to home and preschool libraries for little tool lovers. Discover more about Toni Buzzeo and her books on her website. Tools are terrific when you need to fix something old or build something new! Have fun coloring these tools and their toolbox! Tagged Board Books about Tools, Building Books for Kids, Harry N. Abrams, Jim Datz, picture book review, Picture Books, Picture Books about Building, Picture Books about Tools, Toni Buzzeo, Whose Tools? Sometimes it seems that clutter multiplies while you’re not looking. The beginning of the year offers an opportunity to clean out those closets, pantries, and basements that can be breeding grounds for mess. Getting the house back in shape can be fun if you get the whole family involved. Kids will appreciate being asked for their suggestions on organizing their rooms and may have some pretty creative ideas—just like the boy in today’s book! While Jack’s mother digs in the garden and their dog snoozes in the sun, Jack is reconsidering his house. It’s just like the others in the neighborhood, he says—“boxy and boring and basically bland. / It’s nothing at all like the house I have planned.” Sure, his house will have function and flow, but the rooms inside are where his real genius will show. Then with the flair of an HGTV host, Jack invites his mom in to see what he means. Copyright Chris Van Dusen, 2012, courtesy of Dial Books for Young Readers. First up is the kitchen that has a mind—and arms—of its own. In this “Kitchen-O-Mat,” Jack tells his mom, “You don’t have to cook and you don’t have to clean. / It’s done by a space-age robotic machine. / It makes all the meals, and the food is deeelish. / Then it washes and puts away every last dish.” The living room is every kid’s dream of an indoor playground, with furniture that spins, a ball pit, and two trampolines. Chris Van Dusen knows how to tap into the mind of a child with all of its fantastic imaginings and anything-is-possible daring. Young readers will love seeing what Jack dreams up in his kid-perfect house that combines the best of features of their favorite playgrounds and attractions. Dusen’s sprightly verses pair uncommon words amid complex sentences, and the jaunty rhythm is a joy to read aloud. Dusen’s retro illustrations are bold and vibrant with plenty of cool and ingenious details in each room to fascinate kids. The snaking arms that busily cook in the kitchen, merry-go-round coffee table, replaceable wallpaper, and loop-de-loop racetrack offer the kinds of playful pandemonium that kids crave. If only all smart houses looked this cool. Funny and imaginative, If I Built a House would be a lighthearted choice to inspire creativity at home or in the classroom. To learn more about Chris Van Dusen, his books, and his illustration work, visit his website. Does your room need a little organizing? This fun Shark Organizer Jar will take a bite out the messiness and make your room look awesome too! The onset of spring with its wide-open sunny days seems to beckon to us to open our minds to all sorts of new possibilities. International Ideas Month also invites would-be inventors and clever folk alike to think differently and pay attention to your brainstorms. You never know – there may be a book, a work of art, a new invention, or a solution to a need inside you just waiting to be let out! In the 1860s the streets of New York were…well, not to put too fine a point on it…disgusting. Made of cobblestone and filled with trash, waste, horse manure, dust, dirt, and throngs of people, the roads made for rough travel. Many people had ideas about what could be done to make the streets safer and cleaner. Some thought a moving sidewalk would work, others talked about double-decker roads or an elevated train system. But while there was a lot of talk, nothing ever got done. Alfred Ely Beach, however, peered down from his high office room and studied the street below him. Alfred Beach was a thinker, a publisher, and an inventor. He put his clever mind to work and came up with a solution. He envisioned a train powered by an enormous fan that would travel underground. “People would get where they needed to go as if by magic!” he thought. He couldn’t wait to start building. There was just one problem—he didn’t own the streets. And getting permission to dig them up would be hard. “So Beach hatched a sneaky plan. He would propose building an underground tube to carry mail instead.” As he had imagined, no one objected to this project when he proposed it—not even Boss Tweed, who unofficially ran the city. Given the okay, Beach rented the basement of Devlin’s Clothing Store. Every day he sent in workers to dig and every night wagons took away the debris. For 58 days and nights Beach’s men tunneled under the city, moving forward 8 feet each day. At last the tunnel was finished. It was 8 feet across and 294 feet long—large enough to hold a train full of people. While riders loved it, some people objected. Shop keepers didn’t want potential buyers underground. Property owners were afraid the digging would hurt their buildings, and some felt Beach wanted too much power. Even Boss Tweed no longer supported it since some of his friends had their own ideas on building a subway. When the governor of New York refused to let Beach expand his train, the project came to a halt. The idea didn’t die, however, and “many years later drilling could be heard once again under the streets of New York City” as a train system powered with electricity was being built. Diggers discovered many unusual things buried under the city. Perhaps the most surprising was a brick wall behind which stood a little railroad car rusting in its tracks, a memorial to innovation and the future. Alfred Ely Beach was one clever man, and Shana Corey tells his story with historical perspective, wit, and suspense. Corey’s language crackles with evocative alliteration, stealth, and action. Kids will be excited to learn of the intrigue and imagination that led to this remarkable snippet of America’s history. Fans of Claymation will love Chris Sickels’ multimedia artwork that combines sculpted characters, specially built props, photographs, and illustration. Sickels’ characters are nothing short of astounding. Their period clothing, hairstyles, and expressive faces lend an engaging and realistic dimension to the vintage scenes. Sickels cleverly depicts early New York City and people’s alternative ideas to the traffic problem with sketched in schemetics. His use of color and lighting sets the perfect tone for this highly entertaining and educational picture book. Kids will want to linger over each page to catch all the details of The Secret Subway. For kids interested in transportation, history, inventions, and claymation and other arts, The Secret Subway would be a wonderful addition to their home library. Discover more about Shana Corey and her books for kids on her website! You will be amazed by the art, books, and animation by Chris Sickels on his Red Nose Studio website! This Secret Subway book trailer is just the ticket! 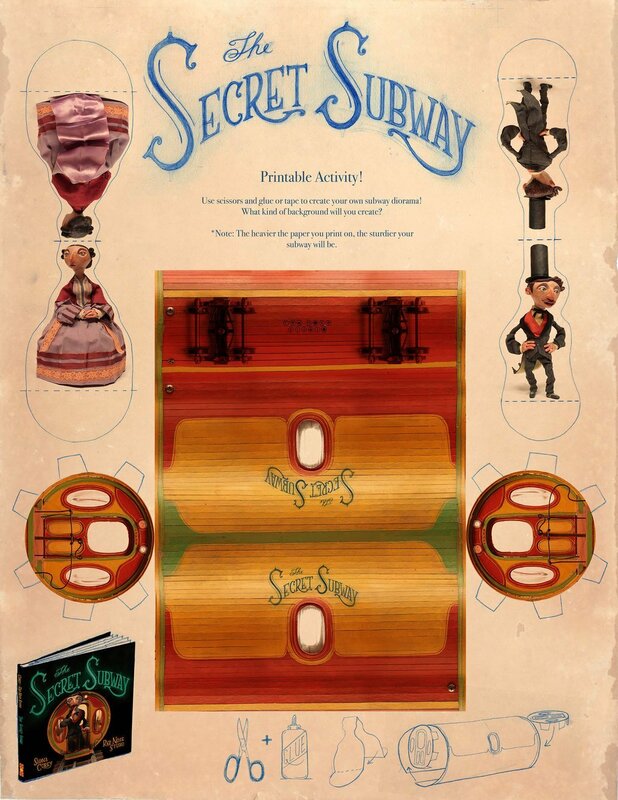 Chris Sickels of Red Nose Studio invites you to build your own Secret Subway with this printable play set, complete with Alfred Ely Beach and a passenger! 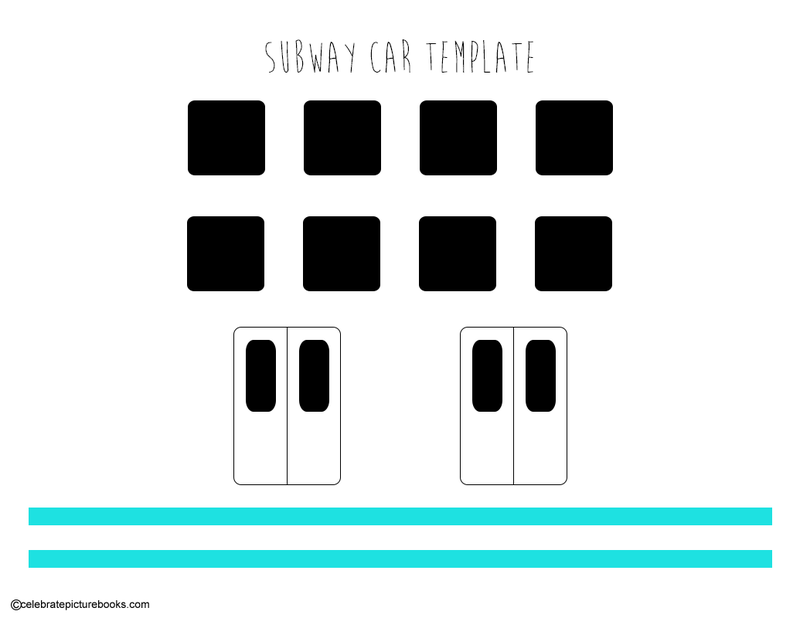 Click here to download your printable Secret Subway Activity! Every day, millions of people all over the world travel to work, school, and other activities by subway. Here’s an easy and fun way to build your own subway train from recycled materials. You can make just one car or make a few and connect them to create a long train worthy of any big city! Our love for friends near and far radiates across the month of February, bringing us closer. To celebrate International Friendship Month get together with old friends and reach out to others you’d like to get to know better. This month would also be a perfect time to find a penpal, write to a member of the military, or send a card to an old friend you haven’t seen lately. As today’s book shows, friendship is the world’s strongest bridge. Here to There and Me to You is a fresh, uplifting story that will appeal to fiction as well as nonfiction lovers. 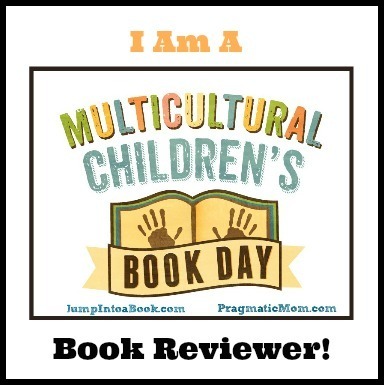 In addition to being a great addition to any story time, the book has many cross-curricular applications for classrooms and libraries, and would be a welcome find on any bookshelf. Reaching out to others is a wonderful way to bridge distances and make friends. In this printable puzzle, all the animals are ready to connect with others—no matter how you put the pieces together! Here is a colored version of the puzzle and one you can color yourself! Do you have a great idea to make the world a better place, a job easier, or life just a little more fun? Then this week is for you! All over the world inventors, thinkers, mentors, universities, and investors collaborate at events, conferences, and competitions to discover new products, creative ideas, and alternate ways of doing things. World leaders from 160 countries and more than 150,000 global organizations work together during this week to improve the lives of all. A little pony-tailed girl and her puppy do everything together. They race, eat, explore, and relax. When she makes things, her best friend unmakes them. One day the girl has a brilliant idea—she is going to make “the most MAGNIFICENT thing!” In her mind it’s going to be “easy-peasy.” She knows exactly how it will look and how it will work. With her faithful assistant following at her heels, the girl gathers materials and goes to work on the sidewalk outside her home. The girl “tinkers and hammers and measures” while her assistant “pounces and growls and chews.” When the little invention is finished, they stand back to examine it. Hmmm…it doesn’t look quite right. It doesn’t feel quite right either. In fact it is all wrong! The girl tries again. She “smooths and wrenches and fiddles” while her assistant “circles and tugs and wags.” It still turns out wrong. Determined to make her vision reality, she gives it another go…and another…and another. She makes her invention different shapes, gives it various textures, measures out assorted sizes. One attempt even smells like stinky cheese! But none of these creations are MAGNIFICENT. People stop by and offer encouraging—even admiring—remarks, but the little girl just gets mad. Can’t they see how wrong her invention is? In her anger the little girl works at a fevered pitch, shoving parts together, her brain fogged by “all the not-right things.” In her haste she hurts her finger. This is the last straw. She explodes and declares that she QUITS! The ever-watchful assistant suggests a bit of fresh air. The girl takes her puppy for a walk and at first her feelings of defeat stay with her. Little by little, though, she pays attention to the world around her and her mind clears. Coming home, she encounters all the wrong things she has made lined up on the sidewalk. Her disappointment threatens to return, but then she notices something surprising—there are parts of each iteration that she likes! You are never too young or too old for Ashley Spires’ inspiring and inspired story. The journey from idea to realization—so often fraught with disaster (or apparent disaster)—is depicted here honestly and with humor as the on-going process it is. Step-by-step the little girl thinks, gathers materials, tinkers, discovers, tinkers some more, and triumphs. It is this last step that is so “magnificently” presented—it’s only by not giving up that success can be achieved. Spires’ tale is a delight of language—the girl “smooths, wrenches, fiddles, twists, tweaks, and fastens, pummels, jams, and smashes.” Likewise, her illustrations wonderfully depict the changing emotions of this thoughtful, steely-eyed, shocked, and ultimately thrilled young inventor. Her faithful puppy is a charming companion and foil, and kids will love examining the early inventions that lead up to the final product. The Most Magnificent Thing is a fabulous book to keep on any child’s or adult’s bookshelf for those times when inspiration hits but achievement seems elusive. Discover more books by Ashley Spires on her website! Every idea begins as a jumble of seemingly unrelated parts. Gathering whatever types of material inspires you and keeping it in a box ready to go when inspiration hits is a great way to support innovation and spark experimentation. Let your imagination go to work! Build something cool, crazy, silly, useful—Amazing! Today’s holiday hosts the largest formalized jumping event in the world and celebrates BASE jumpers, those intrepid souls who test their mettle against the highest points, including buildings, antennas, cliffs, and bridges. Recognized since 1980 Bridge Day is a world-wide event, and while it may not officially be about the bridges, it brings attention to these beautiful architectural marvels while extreme sports aficionados and their fans gather on spans across the globe to have fun.